Homepage > Writing Samples > Academic Writing Samples > Essay Samples > Definition Essay Samples > What is Diwali? As one of the most searched-for questions on Google in 2018, “What is Diwali?” has a simple and not-so-simple answer. Diwali is primarily a Hindu five-day festival that celebrates good triumphing over evil. I say “primarily” because diwali is celebrated in other religions as well, such as Jainism, Sikhism, and Buddhism in some degree. Anyway, in this essay, we will touch upon the holiday’s history, religious significance, and traditions. The word itself stems from the Sanskrit word “dīpāvali,” which means “a row of lights.” Diwali is observed every year at the beginning of autumn after the summer harvest, and happens at the same time as the new moon appears and the darkest night in the Hindu lunisolar calendar. The festival begins two days before the new moon, and also goes two after it. The most important day is on the third day, and is the main day referred to as Diwali. This celebration is observed as an official holiday in about 12 countries, with people getting days off from work and other responsibilities (National Portal of India). 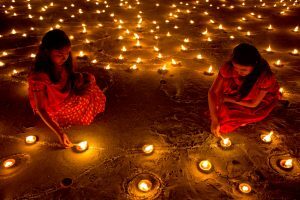 The exact origin of Diwali is not certain, but most scholars say it is a fusion of harvest festivals. The earliest mention of the festival was in Sanskrit texts such as the Padma Purana and the Skanda Purana. Both of these volumes were composed around 700-1000 AD. In addition, the 7th century Sanskrit play Nagananda refers to Diwali, and the 9th century play Kavyamimamsa by Rajasekhara mentions Diwali as well. Besides these texts, this festival of lights has been described by many travelers to India throughout history (Davey, Steve). In many countries, Diwali is celebrated as something as important as Christmas to westerners. Mainly observed in India, it has many traditions there. According to National Geographic, “Hindus interpret the Diwali story based upon where they live: In northern India they celebrate the story of King Rama’s return to Ayodhya after he defeated Ravana by lighting rows of clay lamps; southern India celebrates it as the day that Lord Krishna defeated the demon Narakasura; in western India the festival marks the day that Lord Vishnu, the Preserver (one of the main gods of the Hindu trinity) sent the demon King Bali to rule the nether world” (Allen, Calee, et al.). Yet, the common theme among these regional differences is that it celebrates the victory of good over evil. In terms of other religions, in Jainism, it marks the enlightenment of the great Mahavira, which happened on October 15, 527 B.C. In terms of Sikhism, Diwali is a celebration of the sixth Sikh guru, Guru Hargobind Ji, who was freed from prison. Also, with a few Buddhists, Diwali is observed as a worship of the goddess Lakshmi. These Buddhists, Newar Buddhists, do not see this as a combination of beliefs, but rather their freedom to worship any deity they desire for their spiritual benefit according to the flexibility of Mahayana Buddhism (Lewis, Todd T.). According to the main practices, there are special things a devotee should do each day of the festival. On the first day, Dhanteras, images of Lakshmi are worshipped. According to the BBC, on this day, “Money is ceremonially purified by washing it in milk, to symbolise the renewal of good intentions towards it and the motivation to use it to benefit family and the greater good. It is also a time for sharing wealth with those one considers deserving and to replace feelings of greed with generosity. This spiritual reinvigoration makes it an auspicious day for buying gold and silver, often jewellery, so this day is also a major shopping day” (BBC News). On the second day, Naraka Chaturdasi, Hindus celebrate Lord Krishna killing the demon Narakasura and rescuing 16,000 princesses. Also, rice is used to make rangoli art. On the third and main day, fireworks are set off and is the last day of the Hindu calendar in many parts of India and abroad. It is said that on this day, Lord Rama slayed the demon Ravana, and rescued his wife, Sita. On this night, lights are lit in windows and around the house. On the fourth day, food is piled high to symbolize the mountain Krisha lifted as a child to protect a village from rain by using the mountain as cover. It also symbolizes the new year. On the final day of Diwali, brothers give gifts to their sisters in order to ensure their well-being and safety (BBC News). As Diwali is one of the most popular holidays in the world, it is important to know more about it. It is a day of celebrating the triumph of good over evil, especially in the sense of Lord Krishna and Rama defeating evil doers and securing peace. It is also a festival of fortune, whether it be in terms of finance or spirituality. Practiced by Hindus, Jains, Sikhs, and Buddhists, Diwali is observed by over a billion people every year. “Holiday Calendar.” National Portal of India, www.india.gov.in/calendar/calendar.php. Davey, Steve. Around the World in 500 Festivals: From Burning Man in the US to Kumbh Mela in Allahabad: The World’s Most Spectacular Celebrations. Skyhorse Publishing, 2016. Allen, Calee, et al. “Diwali – Festival of Lights.” Kids’ Games, Animals, Photos, Stories, and More, 23 Oct. 2014, kids.nationalgeographic.com/explore/diwali/#diwali_candles.jpg. Lewis, Todd T. Popular Buddhist Texts from Nepal: Narratives and Rituals of Newar Buddhism. State University of New York Press, 2000. “IWonder – The Five Days of Diwali.” BBC News, BBC, www.bbc.com/timelines/zttjxsg.